My Cat Was Just Diagnosed with Cerebellar Hypoplasia. What Now? While some of us choose to be pet parents to cerebellar hypoplasia cats, others have become CH cat parents by chance. So what should you do if the cat you just found or adopted was just diagnosed with CH? Well, first you can relax. Cerebellar hypoplasia is a non-painful, non-progressive condition that means the kitten has an underdeveloped cerebellum – that’s the part of the brain that coordinates fine motor skills. Cats who are born with CH are often called “wobbly cats” because their underdeveloped motor skills cause them to walk like little drunken sailors. That said, CH cats make wonderful pets and can live as long as any “normal” cat. Cerebellar hypoplasia, or CH, can impact each cat to a different degree. Some cats may have very mild cases of CH and be only slightly unsteady, others may have the condition to such a severe degree that they can’t walk. This holds true within litters, too – cats of the same litter may have varying degrees of CH. You can learn more about the different degrees of CH here. You can learn more about feline cerebellar hypoplasia here. While CH has become more well known over the past decade, unfortunately, some vets are still unfamiliar with it. Even if they may have heard of CH, they may have never actually seen a cat with CH. Consequently, some question the quality of life that these cats can have, and opt to euthanize them. That said, there really is no need for that drastic measure, as many CH cats, even those with severe CH, can live fulfilling lives with assistance. Some folks have joined the CH community and have asked if it’s selfish to keep a CH kitten alive. I’m sure many current CH cat pet parents would agree that so long as the cat is healthy otherwise, euthanasia is not necessary. Trust your gut and don’t let a vet scare you or bully you into making a life-or-death decision. That said, you may want to look for another vet in your area (here’s a list that may help), who has a more optimistic view when it comes to your cat. If that’s not an option, then you’re put in a special position: By helping your cat live the best life possible, you can show your vet that cerebellar hypoplasia cats do have a high quality of life. Perhaps you’ll even change your vet’s opinion of them! Now, here’s the not-so-fun part. Cerebellar hypoplasia’s symptoms are noticeable at or a few weeks after the kitten’s birth. Cerebellar hypoplasia can not be contracted later in life. A misdiagnosis could mean serious consequences. It’s also important to remember that some CH cats may have been born with additional issues too. It shouldn’t be a surprise that if there was damage to the cerebellum while in the womb, there could have been other factors that may have impacted the kitten in other ways, too. There are other conditions that have characteristics similar to cerebellar hypoplasia, or it may be an issue in addition to CH, like a tendency to have seizures. This is not true with all cats, but it is something to keep in mind and watch for. Consequently, brush up on cerebellar hypoplasia basics. If something unusual happens, notify your vet. Either way, this isn’t meant to scare you, rather to prepare you just in case. OK, so now that we have that established, let’s move on to the day-to-day things you’ll need to know! As you’ll see, CH cats, especially when they’re little, may need some extra assistance. As they grow up, many become stronger, more coordinated and able. But before your cat reaches that point, if he does, you’ll likely need a few tips to help you along the way! When you have a moment, please read this post for New CH Cat Parents. In it I highlight a number of posts that will give you a better idea of what CH is, how it impacts cats, and the many ways you can assist your cat. I know it may seem a little overwhelming at first, but bookmark it and save it as a reference so you can come back to it any time you have a question. CH cats can live wonderful lives. If you ever need a little inspiration, you can read some readers’ stories here. Best of luck, and welcome to the CH cat community! As long as my cats were otherwise healthy I wouldn’t even consider euthanasia. They become part of the family the moment you adopt them. Thanks, Colleen! Hope to hear more about your CH cat, too! I am picking up my newly adopted CH kitty on Monday. I am so thankful for your website. I had never even heard of CH before. I saw my sweetie on petfinder.com, and since he was in my area, I went to see him at a Petco adoption event. I fell in love with him. At first I was a little worried that I wouldn’t be able to take care of a cat with this condition. Then I found your site. Now I feel more confident about it. The only question I have, that I haven’t found mention of…when I see the how difficult it can be for these cats to get around, I feel so sorry for the kitties that have this condition. I know they don’t feel sorry for themselves, so will I be able to get past this feeling? Will this feeling of sorrow cause me to limit my cat, and what he can do, in a negative way? Congrats! How exciting! Only time will tell about your feelings, but I hope as you learn more about your cat and see how he progresses, you’ll start to have a change of heart. Keep reading for some other tips on how to encourage your cat by letting him try things on his own now and again. Good luck! Thanks Amanda! I so appreciate everything you are doing for CH cats. I hope I can measure up to some of the awesome CH cat parents here! I have the most loving cat. He has CH and he loves life. Playing and eating and going to the litter box. Normal cats would ignore you. CH cats will be your best friend and wait to hug you and kiss you. Follow your every step. If you look the other good side. You don’t have to be afraid that they jump up on the kitchen counter and bang down anything. This is my first cat and I love him. I get the most love I could get from a pet. I really like this post. Our cat didn’t develop CH but he was attacked by our dog as a kitten and damaged his cerebellum so he had the same motor skills you wrote about. It was a challenge to care for him for a long time but 10 years later he’s one of the best cats we’ve ever had. Hi Amanda. I just, by chance, adopted a CH kitten. She is 14 weeks old and the foster mom said she didn’t notice anything strange about her walk. We noticed the day we brought her home. I wonder if it just came on? The vet says he is pretty positive that is is mild CH. But I still worry that it could be something else…but what? I read that some cats have seizures…in what instances will that happen and if it’s going to happen, when will it? I’m very nervous about the whole thing. I never expected this when we brought her home. Love her though and just want to be reassured that she is ok. Thanks! Hi! That’s super tough; I can’t say, so I’d go with your vet. CH doesn’t come on suddenly so it may be something else, or the foster mom may have just been used to seeing it so she didn’t notice. 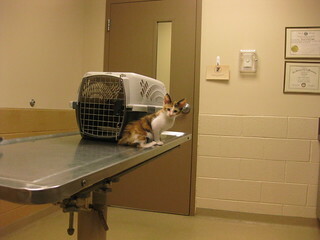 Since your kitten is so little, you may need to bring her in a few more times anyway for shots and checkups. Those may be good opportunities for your vet to keep an eye on her. If you see anything odd, I recommend documenting it so you can bring it up with your vet. Good luck! I love cats more than I do most humans. 🙂 I just want to ask a question about these CH kitties. Are they really happy being unable to walk and falling over and not being able to do what kitties like most? This condition goes against a cat’s natural instinct. They cannot run and jump and do what is their nature to do. Does this not make them unhappy? This is the first time I see this and I am a bit shocked that cats have this condition. I did not know this even existed. It is very sad to see but I also understand the need to love and care for them. I would love and care for any kitty no matter what it’s condition is. I really want to understand how they can be happy even though they cannot fonction by their natural instincts. Thank you to anyone who can help me understand this better.